This time last year Benson Henderson was standing on top of the best division in the UFC as the UFC lightweight champion. He was considered to be another champion that might be able to take over the division and be a dominant champion. Henderson was a promising champion and looked like he was going to be a champion for a long time. Then he would meet Anthony Pettis and would become the latest lightweight champion to give up the belt in his fourth title defence. Henderson would lose to Anthony Pettis when he slipped up and fell into an armbar that would end his reign as champion. The loss would send Henderson into the muddy waters of the lightweight division where there was a long line to get a title shot against the newly crowned champion. With TJ Grant awaiting to get healthy and take his shot and Gilbert Melendez putting on amazing fights there were plenty of contenders for the next title shot. Henderson would be among these top fighters in the division and he would look to earn a title shot at UFC on Fox 10. To do this he would have to beat another fighter among the top in the division in Josh Thomson. Thomson would make his return to the UFC in 2013 after leaving the promotion in 2004. He would move on to Strikeforce where he would earn the lightweight title and become one of the best lightweight fighters in MMA. He would return to the UFC with a Knockout win against Nate Diaz and for the win would earn the respect of the UFC and begin moving up the division rankings. Both fighters would face off in the main event at UFC on Fox 10 with the promise of the winner getting a chance to fight for the title. It was a big fight for both fighters as Henderson was looking to return to the top of the division. Thomson as looking to try to get to the top of the best promotion in the world before his career ended. Both fighters would be facing off against similar opponents as they were both well-rounded fighters. Thomson has the ability to end fights either way with 8 submissions and 6 KOs in his career while many of the other fights were finished in decision. 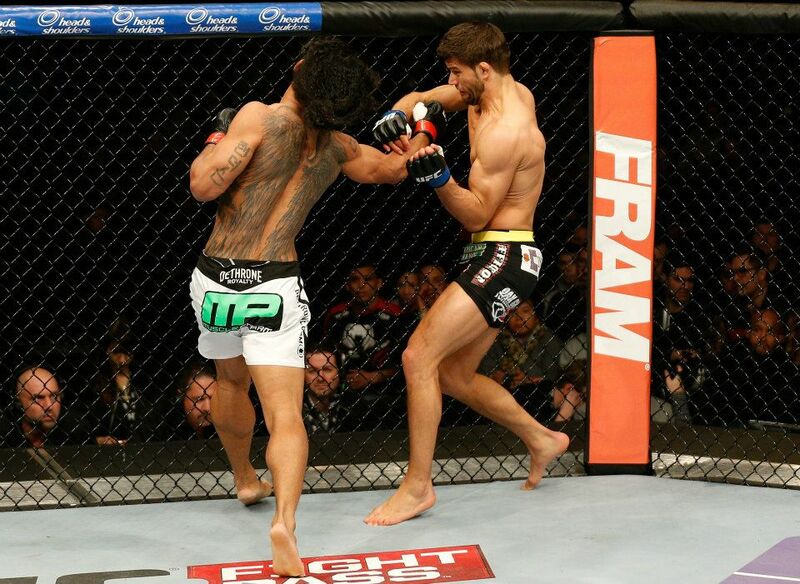 Henderson has been one of the bigger lightweight fighters in the UFC and has used that to his advantage. With 6 wins by submission and 4 by knockout Henderson saw the same balance that Thomson had. Again though Henderson was like Thomson in that more than not his fights would end in decisions. Both fighters would need to earn the win to earn the title shot but as with every title shot a win may not be enough. The real test is trying to impress UFC matchmaker and UFC President Dana White. Only then will either fighter win the chance to fight for a title and get the chance to fight for the most difficult title in the UFC to win. The fight would begin with Thomson getting the upper hand when he took the fight to the ground and tried to get a submission win early. Thomson would continue to get the upper hand in the beginning of the fight but the scales would begin to turn. Thomson would apparently break his hand in the second round and Henderson would start to get ahead on the scorecards. It was a close one and many people believed that Thomson had taken the win with some close rounds that saw Thomson do just enough to get the win over Henderson. In the end though it was Henderson who would take the win in a Split Decision but it was not all good news for the former champion. The fight was not that great and didn’t really impress anyone which became the biggest problem in the fight. Although Henderson took the win Dana White would say that he would not be the next top contender for the Lightweight title. The fact that Henderson was not impressive means he will go back into the lightweight pool and try to earn an impressive win against a top opponent to get the shot. Meanwhile Thomson would take the loss and will take some time off to think of whether he wants to continue his career in MMA. The rest of the card would feature a number of fighters looking to move their way up in the fighter rankings and hoping that they could impress their way to the top of their divisions. In the heavyweight division it would be Stipe Miocic and Gabriel Gonzaga who were both looking to get closer to a title shot. For Stipe Miocic it was a chance to continue what he had done in since he joined the UFC in 2011. He looked like the best prospect in the division but he would take one step back when he lost to Stefan Struve. Now he was looking to get back to his winning ways and put together another winning streak after beating Roy nelson in his last fight. For Gonzaga it was a chance to finally get his chance to move up to the title shot before his time runs out in his career. At 31 Gonzaga has a lot of miles on him and with a gym and training to go to there was not a lot of time left for Gonzaga to make another run. This was his chance though as he was hoping to take out one of the best up and coming fighters in the division to prove that he still belongs amongst the top heavyweights in the UFC. The fight would see Gonzaga come out strong but fail to keep the pace up. Miocic would begin coming back in the fight as his speed would continue on through the rest of the rounds. In the end it was the youth of Miocic that would take the win with a unanimous decision and another win over a veteran opponent that is sure to put him among the best heavyweights. He will not be getting a title shot immediately but will move into the top of the division and will likely have to beat one of the best to earn a shot. Gonzaga on the other hand took the loss and is now left with a debate as to whether he should continue to fight or retire. There is not much hope of him getting back to the title conversation and if he continues to fight it will likely be more as a gatekeeper to the top of the division as a true veteran heavyweight. It was a night to figure out a lot of things in the UFC but not a lot would be found out as few fighters really impressed and the rest put on a bit of a disappointing night.